In my last Operation Foxbook post, I said that when I edited screen images in the browser, I cheated on my Web-only regimen and saved them in Windows Paint first to get them on my hard drive for uploading into Picnik. Turns out that I could have done it and remained true to the spirit of Operation Foxbook–the Picnik folks wrote to tell me about their Firefox extension, which lets you grab images, screens, and even whole Web pages (including regions that aren’t on screen) for editing with one click. I stand happily corrected. 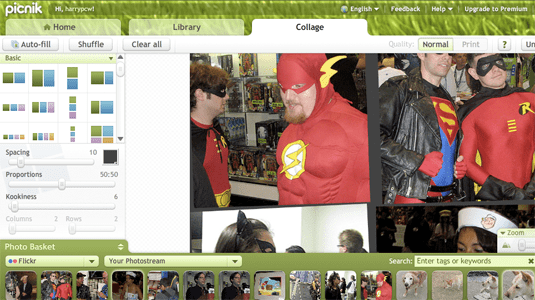 And speaking of Picnik, the service rolled out Picnik Basket, a new set of features for combining multiple photos into one image, today. In the free version of Picnik, they’re pretty basic–you get a few template grids for placing multiple pictures on a page, and can tweak their “kookiness” (whether they’re not skewed on the page, skewed a little, or skewed a lot). And Picnik Baskets were slightly quirky when I tried them just now–I occasionally had to drag a photo into a collage or onto the page twice to get it to work. I can easily see a huge improvement on your Posts, I’ll love to get in contact. Keep up the excellent work! Your Posts are extremely inspirational for someone whos new to this type of stuff.